Dr Weeks’s article on gender quota laws was awarded the 2018 Franklin L. Burdette/Pi Sigma Alpha Prize by the American Political Science Association. 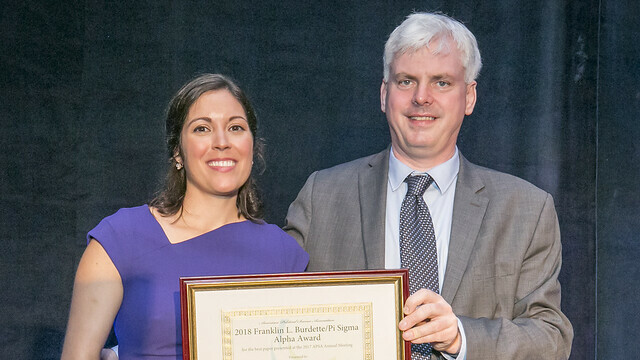 Dr Ana Catalano Weeks from the Department of Politics, Languages & International Studies, has received the 2018 Franklin L. Burdette/Pi Sigma Alpha Prize for the best paper presented at the previous year’s meeting of the American Political Science Association (APSA). Titled Why Are Gender Quota Laws Adopted by Men? The Role of Inter- and Intraparty Competition, Weeks’s article finds that male politicians will enact gender quota laws when it is strategically beneficial (in the context of a rising left-wing competitor) or when it helps them to reassert control of their own candidate selection processes. APSA’s prize committee recognised the paper for “breaking new ground both theoretically and empirically, and for taking full advantage of the insights generated by previous generations of scholarship on political parties”. APSA presented Dr Weeks her award in Boston, USA, at their 114th Annual Meeting & Exhibition, the world’s largest gathering of political scientists and source for emerging scholarship in the discipline. Upon receiving her award, Dr Weeks said: "Gender quotas are one of the most important electoral changes of our time, bringing many more women into political office around the world. This paper is part of a broader research agenda to understand why they get adopted and what it means for policies afterwards - a topic that has practical implications for democratic inclusion. “The award is deeply appreciated recognition, especially since it is the first time that a paper on gender and politics has won." The article also received the 2018 Sage Paper Award for the best paper developing or applying qualitative methods presented at the 2017 APSA meeting from the APSA Qualitative and Multi-Method Research section.